You can get customer response with bright, bold and durable signs, banners and pennants that get attention. 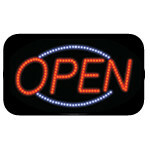 Choose from a large selection of counter top or floor model sign holders. Use accessory clamps and components to attache signs to racks and hang rails. Mark your products quickly and accurately with price guns and labels. With these tools, you can easily mark large quantities of products with important price information. Tagging tools and accessories are an alternative using the strings in hang tags.